Born in Yonkers, NY, William Simpson attended the University of Connecticut and went on to get his MFA from Bowling Green State University. 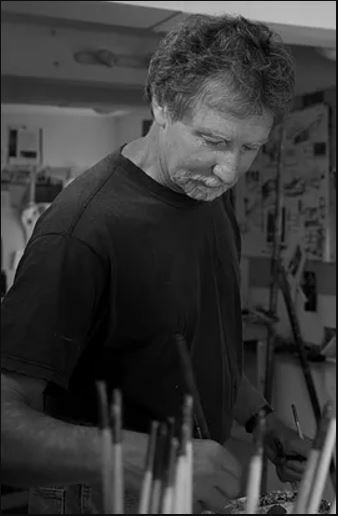 Based in Granby, CT, he has exhibited and taught throughout New England. I make a lot of drawings. I pin these drawings on the walls of my studio – tape them to the windows even – I’m running out of space. These drawings are not schematics meant to solve all the puzzles I will confront in my next painting or large scale charcoal drawing, but rather mental and visual notes to refer to. My studio is like a room full of yellow post-it notes that say, “Remember this!”, “Try that!”, “Mash these two ideas together!”. There are drawings on the walls that have been there for years. To be there that long, there has to be some quality about them that keeps saying, “There’s something here you’re not done with yet, something you need to take another pass at”. That tells me it’s time to do a couple more drawings and figure it out.